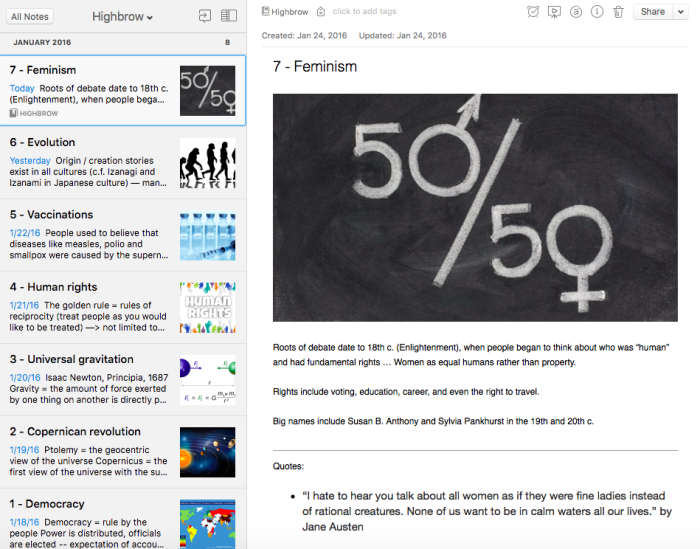 Highbrow can help you learn something new — in just 5 minutes — every day. First, browse the courses, and then sign up. It’s free but you do need an email address. Every morning, you’ll get an e-mail with something new to learn. You can only sign up for one course at a time. They want you to focus and to stick to just 5 minutes every day, because they know that small, everyday goals lead to success. Here’s the one I started with, last year: “Ideas that change the world” (which unfortunately is now a “premium” course. But here’s a similar one that’s still free: “Most Important Historical Events Of The 20th Century”. I continued for the full 10 days, and while I can’t say I really learned anything (my fault for choosing this course), it was satisfying to accomplish that daily 5 minute ritual for 10 days (plus an additional few minutes for note-taking). Many of these courses would be excellent for EFL students. The content they probably already know in Japanese, so it’ll be good practice for reading in English. I’m not sure if this is true for all the courses, but this one has a collection of quotes at the end of each episode. Right now there are 127 courses, some of which are not free. To access these courses, you need to sign up for premium access, which costs $7 per month or $28 per year.